Intermittent fasting is becoming more popular. If you want to start fasting, use one of these 5 types of intermittent fasting to see FAST results! Humans have been fasting for centuries, and for various reasons. Many people fast for religious and cultural reasons. Recently, we have discovered the health benefits of fasting and how fasting can reduce our waistline and improve our metabolic health. The average American eats over 3,600 calories a day. This is way beyond the recommended amount of calories we should eat — 2,000 calories for women and 2,500 calories for men. Fasting, specifically intermittent fasting, helps you cut back on your meals, reducing your caloric intake drastically. There are many ways to do intermittent fasting. 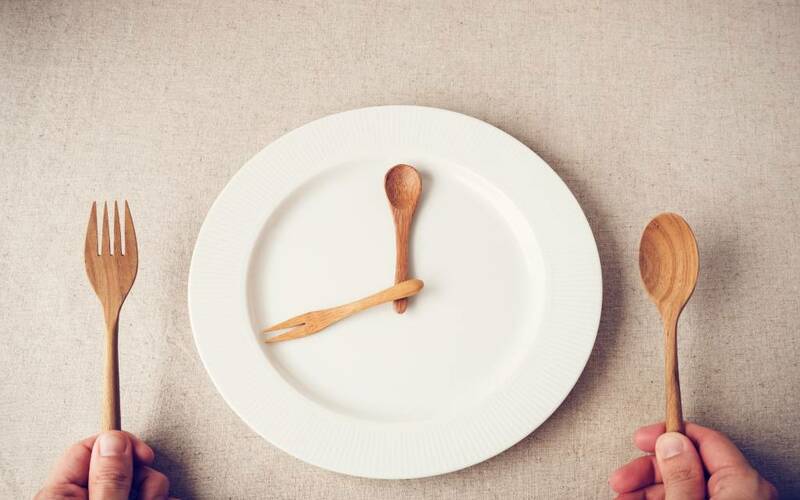 Here are 5 different types of intermittent fasting. Does going days without eating sound awful? It’s not when you break up your day with smaller fasting periods. Here are the most popular types of the intermittent fasting diet. The 5:2 diet involves eating normally for five days a week and fasting for the other two. Does not eating for two days sound unbearable? Don’t worry — for this diet, you don’t have to fully fast. You can restrict your caloric intake, eating only 500 or 600 calories a day. Many fasters prefer eating for certain hours of the day and not eating for the remaining. A trendy method that shows results is the 16/8 method. This method allows you to fast for 16 hours and eat for 8 hours. If fasting for several hours at a time isn’t working, consider fasting for a whole day. Don’t worry, you can eat normally the next day. Keep in mind, this method isn’t recommended for beginners. If you’re struggling to completely fast for one day, limit your calories to 500 a day on fasting days. A beginner-friendly version of the previous fasting method is only fasting once or twice a week. In addition, instead of fasting a whole day, you can skip meals several times a week. The classic example is skipping dinner three or four days a week. Instead of fasting during the evening, you’re fasting during the day and eating at night. This fasting method was popularized by the paleo movement because it’s believed that’s how our ancestors ate. You can eat smaller portions of fruits and vegetables during the day if your appetite becomes too unbearable. If you’re trying to lose weight, there are many different forms of dieting you can choose. The intermittent fasting diet is becoming more popular. There are different types of intermittent fasting for everyone of all dieting levels and that fits all lifestyles. Are you trying intermittent fasting and still aren’t seeing results? Our health section provides more weight loss advice, what you could be doing wrong, different diets you should try, different recipes, and other health trends that will aid your weight loss goals. Click here for more information.